Hi there! Steelrattus again, on day 6 of his 10 day guest stint. I think today’s album must have the longest title of all those I’m reviewing. Collection d’Arnell Andréa, a French darkwave band, have been around since the mid-80s. Curiously, Pascal Andréa left the band before their first gig, but they kept the name. The band currently consists of 7 members, that play a mix of cello, synths, keyboards, viola, and of course the lead singer. Apparently their live performances are known for featuring much larger ensembles. 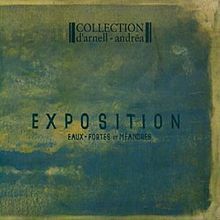 Exposition, Eaux-Fortes et Méandres is Collection d’Arnell Andréa’s eighth album, released in 2007. The concept is based on Modest Mussorgsky’s 1874 Pictures at an Exhibition piano suite, which I can’t say I’m familiar with, but apparently contains ten piano tracks. Exposition, Eaux-Fortes et Méandres is mostly based on darkly themed 19th century paintings. The album cover, and title track Les Méandres, are based on a 1999 painting though, by Richard Boutin. I listened to the album without knowing any of the above, and after making it through a few tracks I thought, “here’s a goth band from the late 80s/early 90s”. OK, so the date was a bit out. It’s definitely all rather dark sounding, against a backdrop of what sound like cheap synths. Not really my sort of thing, but I found it just about listenable to. As always, YMMV.